Was Brian Cashman for the Alfonso Soriano trade before he was against it? This is what a lot of New York Yankees fans should be saying today: Sorry, Hal Steinbrenner, for criticizing the decision to bring Alfonso Soriano to the Yankees at the trade deadline. While we're at it, GM Brian Cashman might want to offer his apologies as well, after saying publicly that he was against the deal. Because now, a little more than a month into his second go-round with the Yankees, Soriano doesn't just look like a bargain, he looks like a steal. Notice that the middle paragraph is missing, and the fact that Cashman opposed the trade is gone from the column! That reads like Cashman is publicly taking a stand that he was against the trade. But I never understood why Cashman would be against the trade in the first place -- Soriano was old, made a lot of money, and looked washed-up -- three things that Cashman usually loves to get in his players! I wrote at the time that I thought that Cash made a big stink about being against acquiring Soriano to get the media on his side again, having them write sympathetic articles about how a big bad Steinbrenner is meddling again. The irony is, of course, that if Cashman hadn't made such a stink, he wouldn't have to do all this revisionist history, because we never would have known this was an issue. Matthews disagreed with me on the meaning of what Cashman said, and we went back and forth on it on Twitter -- you can see the conversation here. While I didn't agree with Matthews, I was impressed that he took the time to talk with me, and that he was cordial, too! Incidentally, I don't know how many Yankee fans opposed trading for Soriano -- I was against it, because I thought they ought to rebuild, not commit any more payroll to 2014, but I was in the minority. And I am happy to admit that I was wrong! At any rate, I have to agree with what my friend Steve of WasWatching.com says when it comes to Cashman: "The Thin-Skinned GM Strikes Again"! Matt Harvey's injury would be a terrible blow to the Mets under any circumstances. But contending teams have enough depth to overcome, or at least mitigate, the damage. The Mets will finally be a contender again when an awful day like this one does not have people writing off the next season. In February 2011, Cardinals pitcher Adam Wainwright was found to need Tommy John surgery. The previous year, Wainwright had won 20 games with a 2.42 ERA, 1.05 WHIP and 213 strikeouts. He finished second in Cy Young voting after finishing third the previous year. Losing Wainwright appeared to derail the Cardinals' hopes for 2011, particularly since it happened too late for the Cardinals to do much about it before the season started. That season, the Cardinals won the World Series. Wainwright returned in 2012, and in 2013 made the All-Star team (and got booed by Met fans). Last season, the Giants won the World Series despite two-time Cy Young winner Tim Lincecum pitching so poorly that he was dropped from the rotation. This season, the Dodgers won a historic 42 of 50 games, mostly without injured star outfielder Matt Kemp. Even with Harvey, the Mets as currently constructed had a ways to go before contending in 2014. But they can still use 2014 to continue building the type of team that one day could actually overcome the loss of a Matt Harvey. Funny how Alex Rodriguez, the player Bill Madden repeatedly insisted "will never play another game for the Yankees," is arguably the biggest reason that the Yankees have won 11 of their last 14 games and are now just 3 1/2 games out of a wild card spot, and 6 games out of the division lead. So where is Bill Madden's mea culpa? How is that "evil plan," as the Daily News once called it on the back page (on the very same day Aaron Hernandez was arrested as a result of an investigation into a murder -- a real evil plan!) working, Bill? Not only has Rodriguez looked great at the plate, but he made some nifty plays in the field and even stole a base yesterday! What insurer in his right mind would pay out a dime to him now? The kicker is that Madden, without ever conceding that any of his hateful screeds were wrong, wrote this just the other day about Rodriguez. Madden says that this winter, A-Rod was "told by the first doctor who operated on his right hip that if he wants to be able to play with his kids when he’s 50 years old, he should really get the second right hip surgery done as well. Operating on both hips, however, would assure that he would never play baseball again." Hmmmm. If Rodriguez were simply looking for a way to simply collect the $114 million owed to him, wouldn't he have simply gotten both surgeries done then and called it a day? But I guess being a Hall of Fame baseball columnist means never having to write that you were wrong. Madden just keeps on going and going with his usual nonsense -- kind of like the Energizer Bunny of MLB columnists! Shocker: David Ortiz sez he 'didn't like' Ryan Dempster plunking A-Rod! "I didn't like it. I don't think it was the right thing to do,'' Ortiz told USA TODAY Sports. "But we don't all think alike, and the guy who did it, Dempster, is a great guy. It's not that I didn't think it was right because Alex and I are friends, because once you cross the white lines, everyone's on their own." Isn't it when you cross the white lines you are supposed to be with your team, not on your own? My Red Sox fan friend Sully Baseball was apoplectic about Dempster, saying exactly what Ortiz said about waking up the Yankees. And Squawker Jon, still on his summer Squawker sabbatical, points out that even if CC's velocity went up, he still gave up four runs to the Sox after this! That being said, if the Yankees make the playoffs (and Tuesday night, after the walkoff win, was literally the first time all season I thought they had a chance to do so! ), we will look back on this night as the turning point of the season. Actually, there are several turning points, and it is no coincidence that the Yankees' current 10 of 13 streak started on Friday, August 9, the first game A-Rod played at Yankee Stadium this year. And how much must it kill Randy Levine and Brian Cashman and Hal Steinbrenner to know that A-Rod, the guy whose career they tried to destroy, is the No. 1 reason this team actually has a chance to make the post-season. (Sully also pointed out that Brian Cashman made a stink about Alfonso Soriano, one of the other main reasons the Yanks are contending!) Not to mention how much ratings and ticket sales are up --Tiqiq told me that in the last homestand, ticket prices have been "up 16% up to $94 on average." Anyhow, that wasn't all that Ortiz said. The following words are just as interesting as him criticizing the plunking strategy. USA Today Sports writes that "Ortiz said it's not clear-cut which party to side with in the A-Rod-MLB dispute because not all the facts have been revealed, such as baseball's evidence that Rodriguez used PEDs and tried to obstruct the Biogenesis investigation. Plus, Rodriguez has not failed a drug test under the current Joint Drug Agreement." "I thought handing down a 200-plus-game suspension had something to do with his contract,'' Ortiz said. Of course, MLB denied in the article that A-Rod's contract had anything to do with them going after him (yea, right!) but Ortiz, in his solipsism, is right. I still cannot stand him but I have to give him credit for understanding what is really going on here. I just want to know what Ortiz thought of Alex's "homage" to him at home plate at Fenway Park after Alex's homer the other night! Did A-Rod's lawyer prove his case on that MRI? Read on! During the 2012 playoffs, Tacopina said, the Yankees hid from Rodriguez that a magnetic resonance imaging test had revealed that he had a torn labrum — essentially a hole in his hip — and continued to play him, even though he was struggling mightily. Yesterday, Tacopina fulfilled Randy Levine's challenge to "put up or shut up" on this issue by revealing an MRI report from October 11, 2012, which showed that A-Rod did indeed have a tear in the labrum of his left hip. If you may remember, October 10 was the night Alex was pinch-hit for with Raul Ibanez in the ALDS. After the game, Rodriguez, who had previously said he was fine, admitted to Joe Girardi that he felt something in his right hip. He underwent an MRI the next day, after which the Yanks insisted that everything was fine with him. But it wasn't. "Stable postoperative appearance of the right hip with no evidence of labral re-tear, stable degenerative change, and only minimal gluteus medius insertional tendinosis. Partial evaluation of left hip revealing superior labral tear with small parabal cyst." The Yankees have previously acknowledged the MRI taking place, but they’ve said it focused only on the right hip, which is the only hip Rodriguez mentioned having any sort of problem. A-Rod did not discover that his left hip's labrum was torn until Dr. Mark Philippon examined him in the offseason. He reportedly only heard about the previous results on that hip from the MRI when Philippon got notes from his medical file revealing that. And now he is reportedly considering filing a grievance with MLB, and is considering a malpractice suit against Dr. Christopher Ahmad, the Yankee team doctor. “He meets with Joe [Girardi] separately and says, ‘Listen, don’t give up on me, put me back in there.’ He’s fighting to stay in,” Cashman said. “Fighting to stay in. But I see Alex’s comments saying ‘I never should have been out there,’ which contradicts his own comments. I see his attorney talking about we’re running him out there like an invalid? I guess he’s also lumping Alex in that, because, again, I don’t get it; he was fighting to play." Now, I am not a doctor, nor a lawyer, nor do I play one on TV. However, I do know this from personal experience that many times, medical tests like MRIs and sonograms find out things that were not what the tests were originally for. I believe the term for that is incidental findings. Such a situation happened with me once -- a few years ago, I had an MRI for one medical complaint, and it was discovered I had a tumor elsewhere, in a different body part where I had felt no pain. Fortunately the tumor was benign, and was easily removed with laproscopic surgery. If I hadn't gotten that MRI, though, I may not have known about the tumor right away, and it could have caused real problems for me. Gee, I'm glad my doctor didn't ignore the issue, figuring that since I didn't complain about that body part, it wasn't worth investigating! The reason I bring this up is to point out the Yankees' rather head-scratching point of view on this is. Just because A-Rod didn't complain about his left hip, and wanted to keep playing, does not mean that a tear and cyst on his left labrum should have been ignored. So why was it? Why did they not put A-Rod on the DL, instead of insisting that he was healthy? Why, after the MRI caught this issue in a partial evaluation, was Rodriguez not given another MRI with a full evaluation in the left hip? Why did the Yankees insist then that A-Rod was fine, when his MRI showed that he wasn't? Who dropped the ball here, exactly? Why did a Yankee official say to Wallace Matthews last month, "He blames Dr. Ahmad for missing his hip injury? He missed his own hip injury?" Why did Cashman say on Sunday that the medical records were "factual," and Tacopina's complaints were "false," and the very next day, when A-Rod's lawyer reveals that the MRI showed October 11 that there was a torn labrum in the left hip, that Cashman say that he "couldn’t tell you" if the labrum "does or it doesn’t" show up in the MRI? Why didn't Cashman look at his own team's MRI report? Why does Cashman continue to fixate on the fact that A-Rod complained about the right hip, not the left? And why is the team claiming not to know about a medical report that their own team doctor commissioned and would have reviewed? Is this situation why Rodriguez wanted a second opinion on his quad strain diagnosis? Somebody in the New York media ought to do some more digging on this issue to find out the full story, instead of simply buying the Yankees' spin. But that would involve real reporting, and not simply writing up leaks from the Yankee brass, so I doubt it will happen! I didn't get a chance to squawk this morning -- I had real-life stuff to take care of -- so this afternoon, I was trying to think of a fresh angle on the Yankees-Red Sox and Yankees-A-Rod feuds for when I did get to write. Obviously I was disgusted at Ryan Dempster for him hitting Rodriguez and was happy to see A-Rod get his revenge, complete with him pulling a classic heel move by imitating David Ortiz's double finger point at home plate after Alex's home run. (Thanks to my Facebook friend Alan for pointing that out!) And how about Joe Girardi flipping out with the umpire? The postgame was over the top, too, with Girardi comparing Dempster to "My Cousin Vinny" and A-Rod saying that he was the last one to talk about suspensions, but he could recommend. And of course it was the best Yankee game of the year, by far. Anyhow, I also said to my brother that hat I thought that A-Rod had nothing to lose by going after the Yankees and MLB here, since his name was already mud. Not to mention that they are kind of proving his point that they are out to get him, what with all their negative talk and shenanigans. On the other hand, the team -- and MLB -- have a lot to lose by getting in the mud with Rodriguez. If there case is so strong, why all the leaks? Why don't they just say "no comment" and let the process play out? So I was formulating my squawk in my head, but when I got home, I saw that ESPN's Wally Matthews, of all people, beat me to the punch and said virtually everything I was thinking and more in this column! Is it really worth it to baseball to expose its dark side in order to make an example out of Alex Rodriguez? Is it really worth it to the Yankees, a franchise worth more than $2 billion, to try to get out of paying him $86 million. We know that lawyers bluster all the time. It is what they do for a living. But what if Rodriguez's side does have even a fraction of the evidence it claims to have against MLB and the Yankees? You took the words right out of my mouth, Wally. And that's unsanitary! Anyhow, I would like to see the media actually, you know, investigate A-Rod's lawyers claims, and see if they are true. Imagine that! Squawker Jon, who apparently is on a summer squawking sabbatical, pointed that Tacopina deliberately said that George Steinbrenner would be "horrified" with what was going on as part of his long game, to get media people to write about how Steinbrenner indeed did similar shenanigans, and put that in people's minds. Hmmmm! Anyhow, I don't know what the Yanks and MLB are thinking here. If their case is so persuasive against Rodriguez, then why don't they just take the high road and let this play out? Granted, all of A-Rod's charges don't disprove the charges that he took PEDs. But if his people are able to prove shenanigans in acquiring that evidence, or other Yankee mayhem, who knows what will happen? I did see that Cashman was whining about how all this is a distraction keeping him from doing the rest of his job. Oh, please. You make $3 million a year, dude -- learn to multitask! It's an A-bomb for A-Rod -- and his attorney! Joseph Tacopina, one of Alex Rodriguez's attorneys, started a new war with the Yankees -- or maybe just continued the current war -- when he unleashed some pretty strong accusations against the team, and against Major League Baseball. Here's a link to the New York Times article with the accusations. And here's what I think of each main charge. "that baseball’s commissioner is determined to brand Rodriguez as the 'poster boy' for doping." My thoughts: TRUE! This is a no-brainer. Nobody else involved in the Biogenesis scandal got any of the incessant leaks from MLB. Nobody else came even close to the 211-game punishment. And there has never been an explanation as to why Bartolo Colon, who had already tested positive, and who was also named in the Biogenesis scandal, did not get the scrutiny that A-Rod did, even though the fact that he is having arguably his best year at the age of 40 ought to have brought on more investigation. Instead, we're apparently supposed to think Colon only did PEDs that one lone time. Spare me. My thoughts: MAY BE TRUE! Here's why I cannot dismiss this charge -- my own eyes. I said all along during last year's postseason that I thought A-Rod looked injured. And I couldn't understand why Joe Girardi and Brian Cashman were so publicly adamant that he was not injured, when it clearly seemed like he was. It seemed to me very petty and mean-spirited to not offer him that fig leaf of the possibility that he was hurt, instead of just stinking for no reason. And the Yanks seemed more motivated by destroying what was left of A-Rod's reputation last year than in actually winning in the playoffs. My thoughts: MAY BE TRUE! Randy Levine isn't exactly known as a nice guy. He was hired to be a jerk, and he continues to be a jerk. Nothing would surprise me when it comes to him. And why he still has a job is beyond me -- he screwed up bigtime on the StubHub stuff. In fact, I'm surprised he didn't find a way to blame StubHub for A-Rod! Tacopina said he had copies of “very damaging” e-mails between Levine and Rodriguez. Those e-mails, along with recordings and affidavits gathered by Rodriguez’s advisers, will help Rodriguez in his suspension appeal hearing, Tacopina said. Levine, however, said his e-mail communication with Rodriguez, over a period of years, would show that he was one of Rodriguez’s biggest supporters, encouraging him to get healthy and to play better. My thoughts: TRUE. The only way I can see Levine writing the way he claims he did is if he wrote "You little bleep, you better bleeping get healthy and play better, you worthless bleep bleep bleep." I can buy Joe Girardi doing the warm and fuzzy thing. Randy Levine, no bleeping way! Beyond Bosch, Tacopina accused baseball investigators, some of them former police officers, of serious misconduct. For example, he said, investigators were captured on video flashing what looked like police badges to gain access to a gated community where they wanted to speak with a witness. He said investigators also threatened to turn witnesses’ names over to the news media or call in law enforcement if they did not cooperate. My thoughts: THIS WOULDN'T SURPRISE ME. MLB has been intent on drumming A-Rod out of baseball, and they made legal threats to Bosch to get him to cooperate. No shenanigans they may have done would surprise me. Tacopina said he believed that baseball officials were “working in conjunction” with the Yankees to void Rodriguez’s lucrative contract. “You don’t need to look much further from the top to figure out where this all comes from,” Tacopina said, referring to Selig, the commissioner. My thoughts: TRUE. And MLB and the Yankees' damage control on this has been laughable. Levine told ESPN that the Yanks were kept "in the dark" about the pending disciplinary action for A-Rod. Puh-lease. Who believes that, especially given that A-Rod just happened to get cleared to play on the day the suspension was going down. Sorry, folks, but for the past year or so, we have heard leak after leak from Yankeeland about how they want to get out from under A-Rod's contract, and in the last few months, we heard how MLB wants to ban A-Rod for life, and how they've been trying to punish him for years on various shenanigans, but have been unsuccessful. Now we're supposed to believe that this isn't really true, and that they weren't working in cahoots? I'm not buying it. A-Rod may have been a cheating jerk, and MLB and the Yankee brass are not exactly saints here. Maybe they should have thought first, before providing all those damaging leaks, whether true or untrue, to the Bill Maddens of the world. FALSE! This would be right up The Boss' alley, especially given what he did with Dave Winfield by hiring Howie Spira. This was the most ridiculous part of Tacopina's claims! “The weeping of ‘You broke my heart,’ that’s silly,” Milano said. “I don’t see anybody weeping over Francisco Cervelli. That leads me to the point of this article (thanks for bearing with me!) It's how the booing of A-Rod for doing PEDs is more than a little hypocritical for Yankee fans to do so. And most of it has to do with people who didn't like A-Rod in the first place for various reasons, most having nothing to do with steroids or other PEDs or anything else. It's like the sentiment I've heard recently about how A-Rod's a cheating bum, and the Yanks ought to replace him with Detroit's Jhonny Peralta at third base next year. Never mind that Peralta was also suspended in the Biogenesis scandal! Because if Yankee fans' sense of outrage were consistent, they would boo Andy Pettitte. Yet 9.9 times out of 10, whenever I mention this to a Yankee fan, I get back the lie "He only did it one time to heal from an injury!" Was there *ever* talk of booing Andy Pettitte in 2008 or since? Of course not. And what about Cervelli? And what about supergenius GM Brian Cashman acquiring former Met Fernando Martinez this year *after* he was named to Biogenesis? And what about the many players suspected of juicing that Cash has signed in recent years? Most notably, what about the 2000 Yankees? Nine of them were in the Mitchell Report. Is anybody suggesting that we no longer count 2000 as part of the 27 World Series titles? And are we not going to count 2009 anymore, either, because A-Rod was the No. 1 reason for No. 27? How about 1996, 1998, and 1999? Steroid users were on those teams, too. 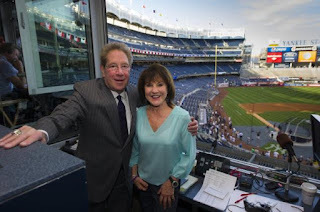 Maybe to be on the safe side, we Yankee fans should start saying that our team only has 22 titles, because all the rest are tainted in some way. You think that will fly? I thought about going to A-Rod's return, but I will *not* be at Friday's game. Here's why -- I'm afraid I will end up sitting next to some jerk booing A-Rod, I will say something, we'll end up in an argument, I will have a lousy time, and I'll be ticked off all the way home. Not to mention having to pay money for the privilege! Nah, I will watch the game for free on TV instead. Going there in person is not worth the hassle. Frankly, given how poorly this team has played as of late, A-Rod's return is going to be the only thing that increases ticket sales or ratings! And finally somebody in the New York media says what I have been saying for ages -- that the A-Rod saga distracts people from all the other issues with this team. Of course, it's Wally Matthews with ESPN New York, and he *still* won't give Brian Cashman any of the blame. Shocker. 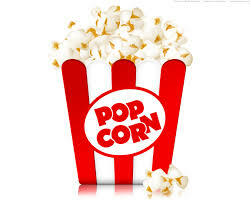 Do you have your popcorn ready? I do. If all goes well, and A-Rod doesn't wimp out and settle, tonight is going to be one of the more bizarre moments in baseball history. And I cannot wait! Are you kidding me? Seeing A-Rod get to play *after* he has been suspended -- and after the Bill Maddens of the world said that he was trying to collect on his contract via insurance and never play again, and after the Yankees tried to get him run out of town on a rail, and after MLB threatened to ban him from the game forever -- is going to be hilarious. Not to mention that A-Rod's return will increase the Yankees' ratings -- and ticket sales when the team returns to the Bronx. As much as they hate him, and want to get his contract off the books, he is great for their business! The media made a point of saying that Rodriguez was "delusional" for thinking that he would be back with the team, playing on Monday night in Chicago. Well, barring some unforeseen shenanigans, it looks like they were wrong. And it couldn't have come at a more miserable time for the team. The Yanks can't score runs, they can't pitch well, they have fallen behind Kansas City (!) in the wild card race, and Derek Jeter is miserable and hurt. Look at what he said yesterday after the game. “It’s been terrible,” Jeter said. “It’s been like a nightmare. The whole season has been a nightmare. I really don’t know what to tell you.” Poor Jeter -- when he's depressed and not his usual "I'm fine," you know things are bad! Meanwhile, the Yanks have wasted the summer praying in vain for a savior to rise from these streets, like Bruce Springsteen sings, and they now have A-Rod back. Heh! Their own rules and policies were that PED cases were supposed to be kept confidential until the suspension comes down, and the person either agrees to take the suspension, or loses the appeal. Instead, baseball thought that it was a smart idea to conduct this whole thing through their minions in the media. If they hadn't done so, we would have no idea with A-Rod's return tonight that he would be appealing a suspension. Anyhow, Squawker Jon and I noticed that MLB's time to announce the Biogenesis suspensions got pushed back -- yet again -- and is now at 3 p.m. today. Are they still trying to coax a settlement out of Rodriguez? I hope doesn't cave. He needs to keep the heel turn, and fight this every step of the way. Do you think he's licking his chops, visualizing hitting a home run in his first at bat? Do you think he wants to tell Brian Cashman and Bud Selig to shut the bleep up? I think so! Let's concede: A-Rod used PEDs. He is overpaid, and way past his prime. He has really bad judgment an awful lot of the time. He says dumb things, he eats at Hooters (a true culinary outrage, in my view), and he told kids not to take steroids while he did it himself. He will never rival Mariano Rivera in being likeable or liked. He ticked off MLB by playing poker. He cheated on his wife with Madonna. I could fill up this blog entry with hundreds of examples of his dopiness. All that being said, there are rules in place in baseball to handle PEDs. You can read the Joint Drug Prevention and Treatment Program here. And in no place does it say that arrogant jerks should get a bigger punishment from MLB just because many people find them unlikable. Or because they make a lot of money. The rules also talk about first offenses, second offenses, and the like. But there isn't a "one-strike-and-you're-out" policy, the way MLB would like to have it now. Heck, even dealing drugs is only an 80-to-100 game suspension! "A-Rod’s lack of support however is exactly what makes him such low hanging fruit for Bud Selig. And that’s precisely why the Major League Baseball Players Association needs to be fighting his suspension tooth-and-nail. Unions are not supposed to be fan clubs. They are not organizations of the righteous, the pure, or the politically pitch-perfect. If they are to be worth a damn, in baseball or anywhere, they need to be the broadest of broad churches: institutions that will defend their most loathsome members because they understand that “an injury to one is an injury to all” is more than a slogan on a t-shirt. If a player can no longer take the field when appealing a suspension, that also disempowers the entire point of an appeal's process and if Bud Selig can get away with invoking the “best interests of the game” clause on A-Rod, then a precedent has been set and no one is safe." What, exactly, has Rodriguez done to justify the threat of being banned from the game? When MLB banned Pete Rose, they had the Dowd Report, which explained exactly how Rose bet on the game. Is MLB planning such a scholarly thing, or do they think that simply leaking rumors and such to Bill Madden is enough. Did A-Rod try to buy up the Biogenesis records, or did Tony Bosch try to shake him down for money? Is Bosch exaggerating things on Rodriguez because MLB is paying him to "get" A-Rod? Seven hundred plus games -- or even two hundred plus games -- are obviously long periods of time, and unprecedented in MLB history for what is technically a first PED offense. And neither number is in proportion in what other players have received. Look at the suspensions that Melky Cabrera and Ryan Braun and Manny Ramirez have gotten. What has A-Rod done to deserve to be suspended worse than them? MLB needs to tell its fans on the record, and not hope to browbeat A-Rod into a settlement so they don't have to publicly say exactly what they claim he did. One of the rare smart things A-Rod has ever said is when he recently talked about the powers that be trying to find "creative ways to cancel your contract" -- something he said should be "concerning" for present and future players. Because if MLB gets away with effectively voiding A-Rod's contract, this will be something that other players need to worry about. And what's to say that somebody won't hire a Howie Spira type to dig up dirt -- or make up dirt -- to get a team out of a bad contract? Buck Showalter knew what he was doing with his supposed "off the record" conversation about how the Yanks would financially benefit from getting rid of A-Rod via this maneuver. I have said it before, and I will say it again, but managers and front office execs and owners need to have some skin in the game. I'll bet that Brian Cashman is practically licking his chops at the prospect of having another 30+ million that he can spend stupidly. It shouldn't be that way, especially not when it is very possible that the Yanks are working hand-in-hand to "get" A-Rod. MLB needs to say that any such salary should still count against teams' payroll, and that the money is donated to charity -- or back to the fans, the way the Brewers are doing with Ryan Braun's salary. I have to admit that I am digging A-Rod's heel turn -- he is no longer trying to hide his contempt of the Yankees and MLB. What dirt does he have on the Yankees? What shenanigans have been done against him? How far is he going to go to make sure to get his money? How wild is it going to see him play when he has been suspended? Can he turn the Yankees around? Get your popcorn ready, folks! "This is typical Alex," one Yankee official told the Daily News on Saturday. "Instead of taking responsibility for his actions, he blames everybody else. It wasn't the Yankees who introduced Rodriguez to Anthony Bosch. It wasn't the Yankees who introduced him to Dr. Galea, or anybody else." Note: that is not a denial of A-Rod talking about people "finding creative ways to cancel your contract." Instead, it is answering questions that were never asked. I have been working on this story for weeks and I have heard theories expounded by the A-Rod camp that have had everything but Yankees officials and MLB executives high-fiving Lee Harvey Oswald on a grassy knoll. And I will not discredit them. I am sure the Yankees want out of the contract. I am sure MLB wants A-Rod out of the game. But the suspension that is going to be announced either today or tomorrow is about PED use. It is about obstructing the investigation. In all the theories expressed none can explain that away — unless Rodriguez is innocent. He also says that "The Yankees could be guilty. So could MLB. That doesn’t make A-Rod innocent." Sherman misses the point, though -- I am sure A-Rod is guilty of a first offense with PEDs here. But a 50-game suspension apparently isn't enough for MLB and the Yankees, so they are gunning for much more, including threatening a lifetime ban, and treating him differently than they are any other suspected steroid user. And they want to take away his due process rights, too. Incidentally, Sherman also writes that A-Rod has "hired a stable of private investigators and word is they have a bunch of information that would embarrass MLB and the Yankees." Interesting! At any rate, less than 12 hours after A-Rod does his shot across the bow, MLB's minions in the New York Daily News and the New York Post claim that Rodriguez will be suspended for the end of this season and all of next season, which is actually a victory of sorts for him, considering that this amount was the deal he would only get if he agreed not to appeal. But they spin it as a defeat. The News writes: "Alex Rodriguez just talked himself out of a possible settlement with Major League Baseball and faces a 214-game suspension to be handed down on Monday." And the Post writes that "Alex Rodriguez struck out even before he got on the field yesterday." Both claim that MLB refused to negotiate further with Rodriguez or the players' union. Except that A-Rod didn't really strike out. As I said earlier, that 214-game suspension was the offer on the table originally only if he cooperated and did not appeal. Now, according to the media, he has that very same offer from MLB, without taking away his ability to appeal. How is this a defeat for him? In closing, ask yourself this: if MLB has all the evidence against Rodriguez that they say they do, then why didn't they just ban him weeks ago? Why all these moved-back deadlines, and lesser levels of punishment? What are they afraid of here? Those are questions the media ought to ask themselves, instead of carrying MLB's water for them. For our readers who are New York Giants fans, here is a guest column, courtesy of DraftStreet.com, on what you need to know when it comes to playing in a fantasy football money league and drafting Giants players. Manning may be worthy of consideration in a fantasy football money league. He is on the fringe of starting in a 12-team league, finishing 12th in passing yards in 2012 with 3948 and in a four-way tie for ninth in passing touchdowns with 26. His 15 interceptions were tenth worst. Manning has been very durable, starting every game since taking over as starter midway through the 2004 season. He has had at least 26 passing TDs each of the last four seasons and threw for over 4000 yards the last three seasons before just missing in 2012. Cruz led the Giants in receiving yardage and receiving TDs for the second straight season. 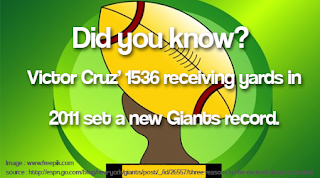 His 10 TDs (tied for seventh-best) and 86 catches were similar to 2011’s nine TDs and 82 catches, but his 1092 yards were down from 2011’s 1536, the highest receiving total in Giants history. As training camp approached, Cruz was reportedly close to signing a long-term contract. After two seasons of at least 75 catches, 1000 yards and seven TDs, injuries limited Nicks to 53 catches, 692 yards and three TDs. Nicks had arthroscopic knee surgery during the offseason and missed OTAs, reportedly because he had broken his foot during OTAs in 2012. Nicks led the Giants in receiving in Super Bowl XLVI with 10 catches for 109 yards. With the departure of Ahmad Bradshaw, Wilson, a first-round draft pick in 2012, has the inside track on the starting job. Wilson had 358 rushing yards, four rushing TDs and one receiving TD as a rookie. 247 yards and three of the TDs came in his final four games. Wilson lost playing time after fumbling in season opener, but he did not fumble again all season. Wilson’s surge also came when Andre Brown missed the final five games after breaking his leg. Brown led the Giants in rushing TDs with eight and ran for 385 yards before his injury. All eight of Brown’s TDs came from one or two yards out, so look for him to be the goal-line back. Brown was originally drafted by the Giants in the fourth round in 2009, but after missing the 2009 season with an Achilles tendon injury, he was waived and was briefly a part of four other teams before rejoining the Giants in 2011. Myers comes over from Oakland, where he had a breakout year with 79 catches (fourth-best among tight ends) for 806 yards (sixth-best) and four TDs. He replaces Martellus Bennett, now with Chicago, who had 55 catches for 626 yards and five TDs. To play in a fantasy football money league or free league, click here.